Norwegian municipalities are making increasing use of non-traditional means of communicating with citizens. Since the 1960s, public administration law has required public agencies to conduct written hearings on policy and planning issues. Recently, municipalities have established new arenas for meeting citizens for oral and reciprocal interchanges of opinions in advance of formal decision-making. A recent survey shows that citizen groups have eagerly embraced these new opportunities for influencing public policy. Since the 19th century, Norwegian neighborhood associations have worked closely with municipalities to provide streetlights, playgrounds and other public amenities. With increased urbanization, their attention has turned to issues of traffic safety, parks and broader environmental concerns. In a total population of 5 million inhabitants, there currently exist about 8,000 local neighborhood associations. In a survey conducted by the Norwegian Neighborhood Federation and published by Oslo and Akershus University College in 2013, 62 percent of a sample of 871 neighborhood associations reported that they carried out one or more projects in cooperation with the municipality. Most common tasks concerned the construction of playgrounds (63 percent), street cleaning (59 percent), traffic safety (57 percent) and parks (52 percent). Largely, neighborhood associations claim to be the initiators of these joint projects rather than the municipality. Looking at municipal planning activities, the picture appears somewhat different, especially with regard to communitywide, long-range planning. In this case, the municipality usually asks for citizen participation at an early stage of the planning process. In more delimited areas, such as traffic planning, interest groups regard themselves as the prime movers of discussion and critique. Yet, actual participation varies considerably. While 70 percent of the neighborhood associations will get involved in traffic planning, only 25 percent take up issues concerning environmental pollution. Traditional one-way channels of influencing policy are far from disappearing. More than 60 percent of all neighborhood associations continue to submit written opinions on public issues in a given year. In addition, they also participate in a wide variety of public arenas characterized by mutual deliberation. The emergence of some of these arenas, such as oral hearings, can be ascribed to changes in urban planning laws, but otherwise municipalities are free to initiate and experiment with a number of alternative methods of citizen participation. In this sense, national legislation follows trends rather than instigate reforms. 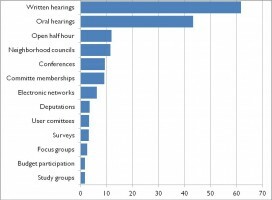 Brief, open discussion meetings, usually called the “open half-hour,” ahead of formal sessions of local councils have proved particularly popular among interest groups, but also among individuals with a grievance. However, some local councils keep up the tradition of receiving deputations or lobby groups of citizens, who usually limit themselves to present a brief statement of opinion on some current issue. In contrast, the open half-hour starts with public, pluralistic debate, the free flow of arguments and counter-arguments and the possibility of consensus building. Interest group representation on committees and boards represents an established tradition in many municipalities. In recent years, there have been strong moves against mixing elected and non-elected members, so as not to undermine the power and responsibilities of the electoral channel. Since all municipalities are required to have user boards for the elderly, their members are in practice recruited from OAP organizations. As can be seen from figure 1, neighborhood associations make limited use of electronic networks to communicate with local government. Few municipalities have established forums for public debate on their websites. Figure 1. Distribution of instruments and arenas used by Norwegian neighborhood associations to communicate with municipalities. Source: Oslo and Akershus University College report 2013 no. 2. N = 907. Percentages. Not covered by the mentioned survey, is the emergence of the citizen initiative that gives interest groups, both organized and ad hoc, power to compel municipal councils to take up a particular issue of concern to the petitioners. A 2010 report from the Norwegian Institute for Urban and Regional Research (NIBR) shows that this new instrument is scarcely known and little used. Even worse, the report documents that citizen initiatives are largely ignored by local government, both at the administrative and the political levels. The failure of the municipal citizen initiative points at some important unresolved questions regarding citizen participation. In a 2005 Public Administration Review article Lisa B. Bingham, Tina Nabatchi and Rosemary O’Leary challenged readers to study practices related to citizen participation in government. The Norwegian case shows that the evolution of new participatory arenas may have paved the way to more open government, but it has proved difficult to determine whether this activity has had any effect on actual decisions. While public officials find it easy to consider the policy process as a series of distinct steps from initiative to implementation, citizens rarely make out this process as clearly. Too often, citizen interest is aroused precisely at the point in time when the decision process has become irreversible. In 2002 Public Administration Review article, Eran Vigoda envisioned a future with the citizen in charge and government officials as subjects. In 2014, Norway celebrates the bicentenary of its constitution, the second oldest in the world. Its history represents a gradual expansion of democratic rights. As part of the celebration, the constitution has been thoroughly revised to include several new articles, among them the freedom to form and join organizations. In this way, Norway has taken another tentative step to realize the vision of the citizen in charge of government. Author: ASPA member Harald Koht, Ph.D. has 40 years of experience working for government in Norway. For 10 years, he worked as OD specialist for state and local government. For the last 30 years, he has taught executive management and public administration at Oslo and Akershus University College of Applied Sciences. He has also taught public administration and politics at the University of Latvia for more than 10 years and been a guest lecturer at universities in Germany, Lithuania and the United States. Koht received his Ph.D. in public administration at American University and has published widely on services to children and the elderly, local government and governmental investigation commissions in the United States and Norway. He is the former chair of the Norwegian Political Science Association and former deputy member of the City Council of Oslo. Koht can be reached at [email protected].